LED Lighting: LED lighting can easily be used in a variety of spaces in your kitchen. By using ropes of LED lights, you can easily light up dark recesses under cabinets and counter spaces. Mix Old and New: Mixing traditional materials such as wood, brick, and stone with more modern elements such as stainless steel. Basic Cabinets: No matter how hot the trend, nothing replaces simply designed, well built cabinets. You can customize them with paint or stained wood finish to compliment your home’s style. Neutral Colors: Make your color palette include neutral colors. Your new renovation can look dated as soon as new color trends change. Avoid this misstep by using timeless neutral colors and accenting with brighter, trendier colors. Keep in mind that other colors can also stand the test of time. A few ideas include: a soft grey, green, and even navy. Glass Door Cabinets: They’re visually appealing and ad the illusion of additional space. Mixing glass doors and traditional cabinet doors allows you to keep less attractive storage space hidden at the same time. 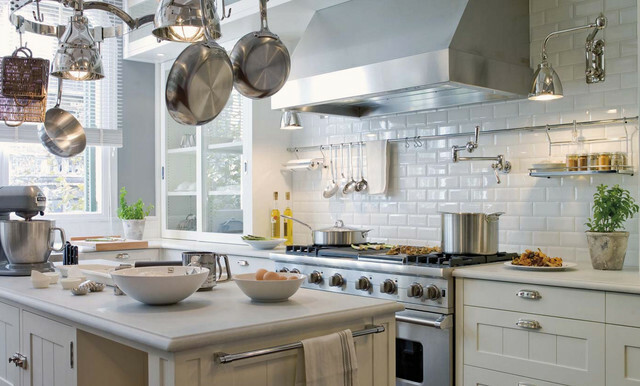 Subway Tiles: The classic white Subway tiles lighten up a small kitchen and make it seem larger. Bonus- they are extremely easy to clean.